I just love the photos of sleeping babies! Maybe it is because they are at peace and so sweet while they are asleep. Today was Robby’s first day back at work. We all seem to have survived! We pushed the date back because Emily got a stomach virus and I was really not comfortable being left alone with a sick kid and an infant. 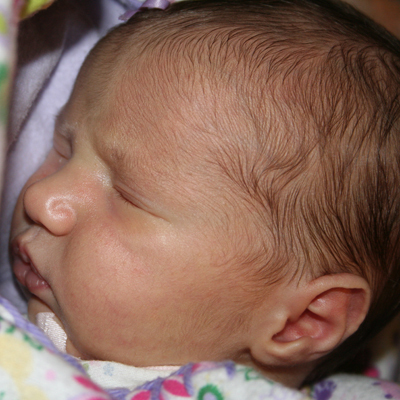 Emily is doing much better now and we were able to keep Julia sheltered enough to not be exposed to the virus. I took Emily to the doctor to see if we could head anything off for Julia’s sake. While we were there she weighed in at 22 lbs. She has gained two pounds in almost three months.